Murphy Beds and Wall Beds in Sarnia Ontario, Murphy Bed Hardware, Wall Beds & Hide a Beds In London Ontario Murphy Beds & Wall Beds. 79 Bessemer Road London Ontario. 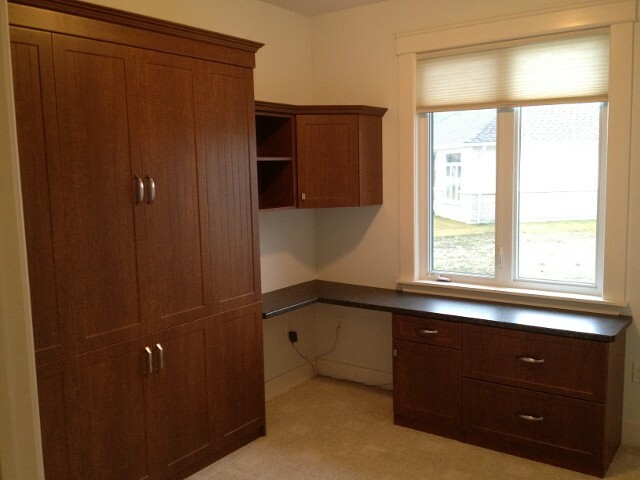 Our FREE in-home consultation will show you several styles of murphy and wall beds. It will allow you to experience first hand the quality of our workmanship. Schedule yours today. No time for a consultation? No problem, call or e-mail us your ideas and we will make your vision a reality. Our 3D rendering software can show you your new murphy bed system before you order. Of course we are happy to design, create and intall your murphy bed - wall bed system. However we do sell just the hardware for the do it yourselfer. We	will	of	course	provide	you with instructions. Sarnia Murphy Beds: Helping Organize Your Home With Affordable Solutions..
At Sarnia Murphy Beds we specialize in multi-functional space saving solutions which allow you to turn limited space into a usefull area, while still maintaining a organized appearance. 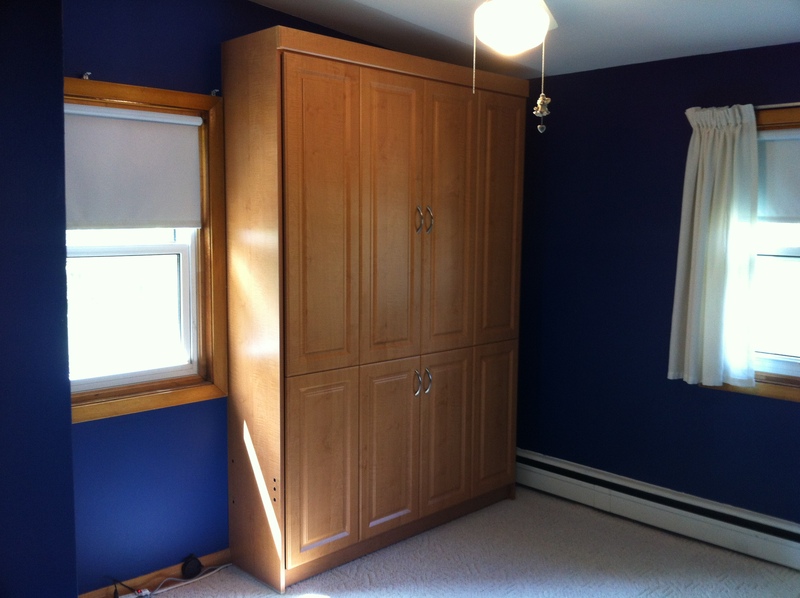 We help create more room for work, family, hobbies and guests with the highest quality Murphy Bed systems. Choose from our large selection of Murphy Beds, Wall Beds, Panel Beds, DIY Murphy Bed Kits & Wall Bed Kits that will allow you to convert your space to that perfect room that is tailored to your wants and needs. We are proud to be 100% Canadian owned and operated. Here are some of our AMAZING products we hope you enjoy! 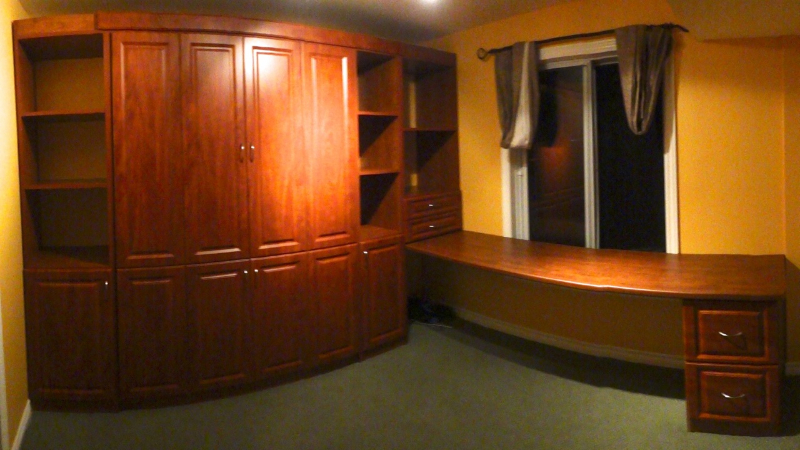 Our Library Murphy Bed is definitely one breath taking systems. Unlike our competition who use a single "Barn Door" style track which depends on rear bottom rollers to stabilize and support each door, our doors are suspended from two Swiss HAWA tracks, and eight HAWA rollers that never touch the floor. Our sliding door mechanisms are the best in the industry. They come with a life time warranty and are able to hold 400 pounds each. The superior quality of HAWA Switzerland rollers is one of the major reason's our clients choose us over the competition. 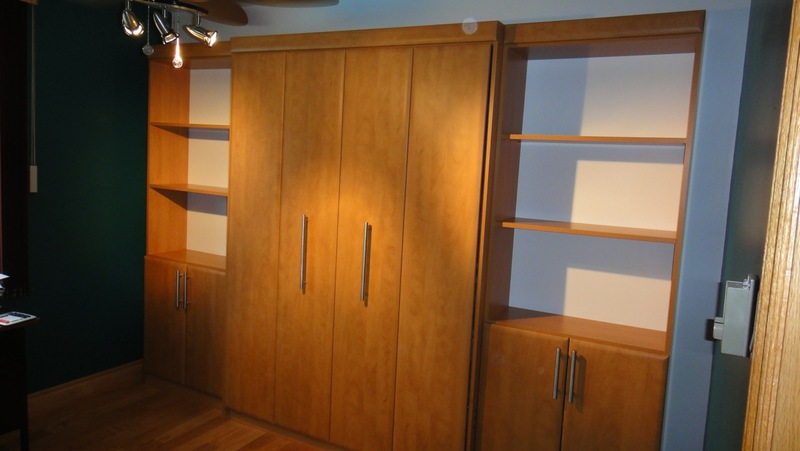 The Library Murphy Bed can be designed to accommodate any wardrobe or storage options you need. 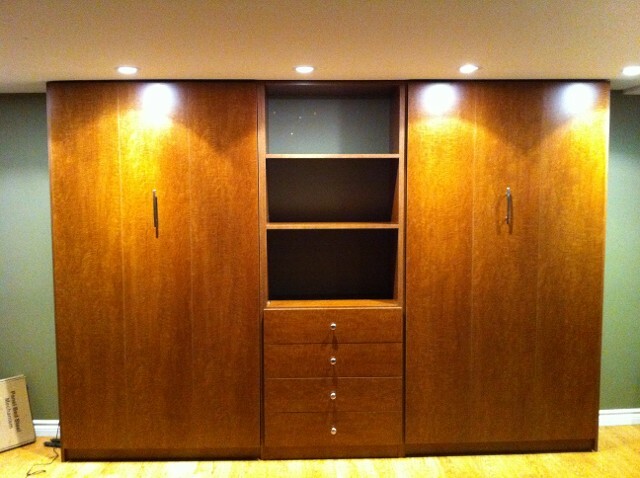 We can add doors with hangers, drawers, etc. Glass shelves with pot lights over head are a great way to add class and showcase your collected pieces. 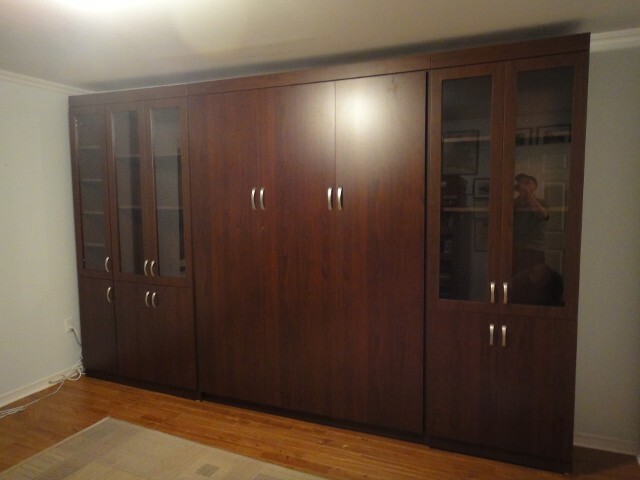 Visit our showroom in London Ontario and see our Library Murphy Bed today! 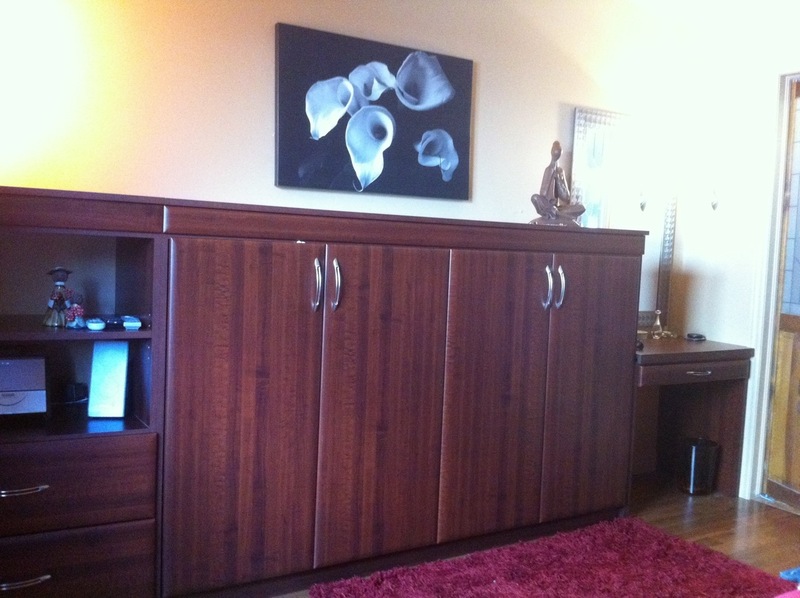 Home Office Murphy Bed Systems At Sarnia Murphy Beds In London Ontario. Whether you need a space to check email, or a professional office to work from home. 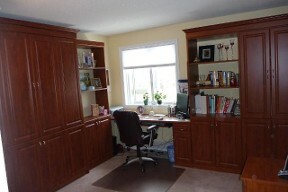 Sarnia Murphy Beds can design and build a home office to manage your needs. 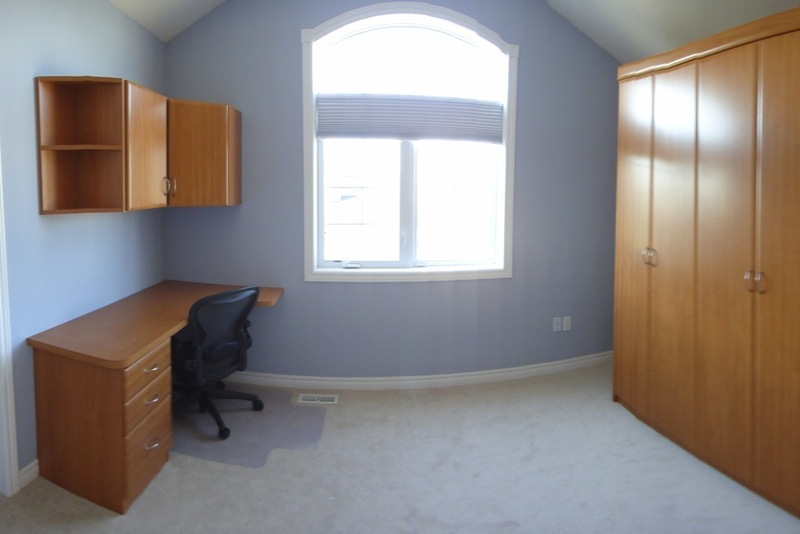 We understand that most home offices need to be flexible enough to accommodate mixed usage. Using advances 3D CAD software we can show you a design suited for tasks like bill paying, craft projects, hobbies and of course computer based work as well. Our Home Office Murphy Bed Systems will give you the best of both worlds without the expensive costs of renovating your home. We will create a functioning work space that is perfectly tailored to your individual needs while still being able provide a comfortable guest room for friends and family. Our Standard units achieve this in a "footprint" as small as W4ft by H7ft by 15 inches deep! We can design, build and setup a system with a "built-in" look, without the aggravation of 5 trips to the hardware store when the "ready-to-assemble" furniture you purchased has parts missing. We invite you to our showroom for a demonstration of the remarkable functionality you can achieve with a dual-purpose Murphy Bed Home Office System. Our Horizontal Side-Tilt Murphy Bed System. Some ceilings are lower than others, especially in basements or attics. 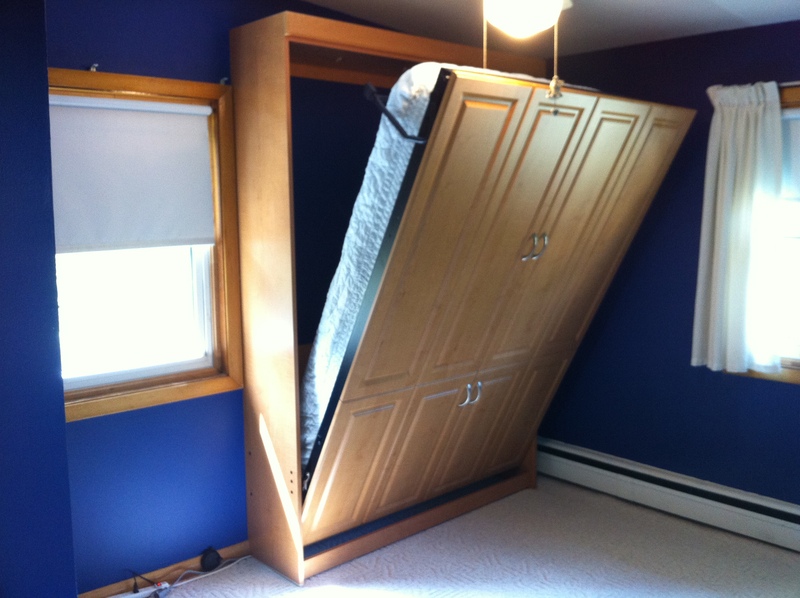 This is where Sarnia Murphy Beds can help! Our Horizontal Side-Tilt Murphy BedSystem is great for spaces where slanted walls, bulk heads and low ceilings have limited your options. A Horizontal Side-Tilt Murphy Bed System will accommodate both overhead and side cabinets for extra storage if needed. The Horizontal Side-Tilt Wall Bed System is available in 34 colours, or any finish. We have a Horizontal Side-Tilt Murphy Bed System available for viewing in our show room in London Ontario. Horizontal Single Wall Bed – Height 51" Width 80" Depth 15"
Horizontal Double Wall Bed – Height 66" Width 80" Depth 15"
Horizontal Queen Wall Bed – Height 72" Width 85" Depth 15"
Our Raised Panel Murphy Beds. Raised Panel Murphy Beds are our top selling Murphy Bed Systems. Our Raised Panel Murphy Bed Systems are availible in unfinished and finished MDF, Thermofoil, and of course Natural Wood. All material is cut with a Diamond core for precision. This process makes for a product that is much higher quality than what you will find in a "Big Box" store. Although we carry all four types of Raised Panels (Bare, Lacquered,Thermafoil, Wood) Thermofoil is by far our best seller. Our Thermafoil doors are more durable than wood, less pron to cracking than lacquerd MDF, environmentally friendly and very easy to maintain. No one offers more choices for Raised Panel Murphy Beds than us. Please visit our showroom in London Ontario and see for yourself, the possibilities are endless! Vertical Single Wall Bed – Height 85" Width 45" Depth 15"
Vertical Double Wall Bed – Height 85" Width 60" Depth 15"
Vertical Queen Wall Bed – Height 90" Width 66" Depth 15"
Our Flat Panel Murphy Beds. 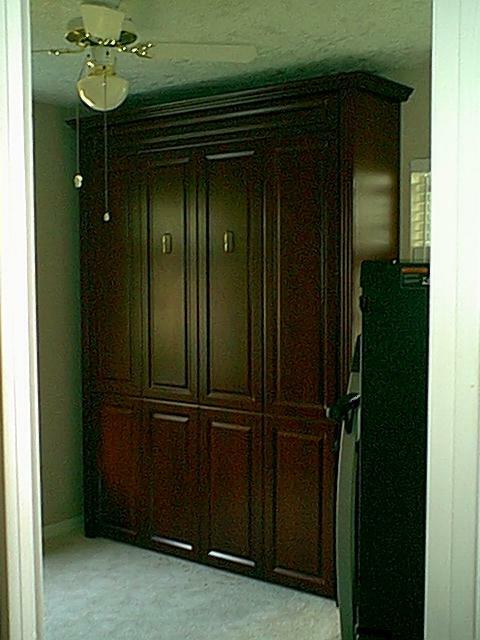 Our Flat Panel Murphy Bed can be made out of Tafisa Thermofused Melamine or Wood Veneer. Thermofused melamine (TFM) is a Canadian made high-value, decorative surface panel. Tafisa TFM panels begin with TafiPan or TafiPan-Eco at the core and then undergo a process of thermally fusing (no gluing necessary!) a decorative print with high-resolution woodgrains, abstract designs or solid colors to either one of both surfaces of the panel. The prints are treated with a melamine resin that, under heat and pressure, actually become part of the panel itself - thus the term "thermofused" melamine. Tafisa Canada is an industry leader in the manufacturing of Melamine and the resulting product is far superior to what is carried by the "Big Box" stores. Themofused Melamine is availible in 34 colours. Wood veneer refers to thin slices of wood, usually thinner than 3 mm (1/8 inch), that are glued onto core panels to produce flat panels such as doors, tops and panels. Wood veneer Flat Panel Murphy Beds can be stained or colour matched to over 1 million colours, we know of no one that offers close to that amount of choice! Both Thermofused Melamine and Wood Veneer Panels can be viewed in our London, Ontario Showroom. Our Solid wood Murphy Beds At Sarnia Murphy Beds. Without question, Nothing beats the look of real wood! All you have to do is look at it and you instantly know the the quality that went into it. We offer many kinds of wood units and availbility can vary during the year. 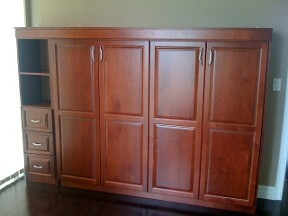 If your interested in a Solid Wood Murphy Bed or Office System please call us for specifications. Although we offer over 1 Million Colour & Staining options, this product is also available unfinished if you would prefer to paint or stain it yourself. The Sunrise Edge Murphy Bed. Our Sunrise door panels (also refered to as "Pillowed Edge") provide a very clean and sleek look that has become quite popular over the past 5 years. Sunrise doors have a modern flat look but with a slight amount of curviture around the sides. It's very difficult to appreciate the beauty of the Sunrise Edge through picture and is best viewed in person. Our showroom in London Ontario has the Sunrise Door on display. Our Sunrise Murphy Bed can also be seen on display at Matress Depot in London Ontario. Sarnia Murphy Beds services customers throughout southern Ontario & Northern U.S.A. including London, Toronto - GTA area, Kitchener, Waterloo, Cambridge, Scarborough, Oshawa, Oakville, Burlington, Mississauga, Stratford, Guelph, Hamilton, St Catherines, Niagara, Sudbury, Collingwood, Brampton, Brantford, Windsor, Sarnia, Leamington, Kingston, Kingsville, Wisconsin, Illinois, Indiana, Ohio, Pennsylvania, New York. © 2010 Sarnia Murphy Beds. 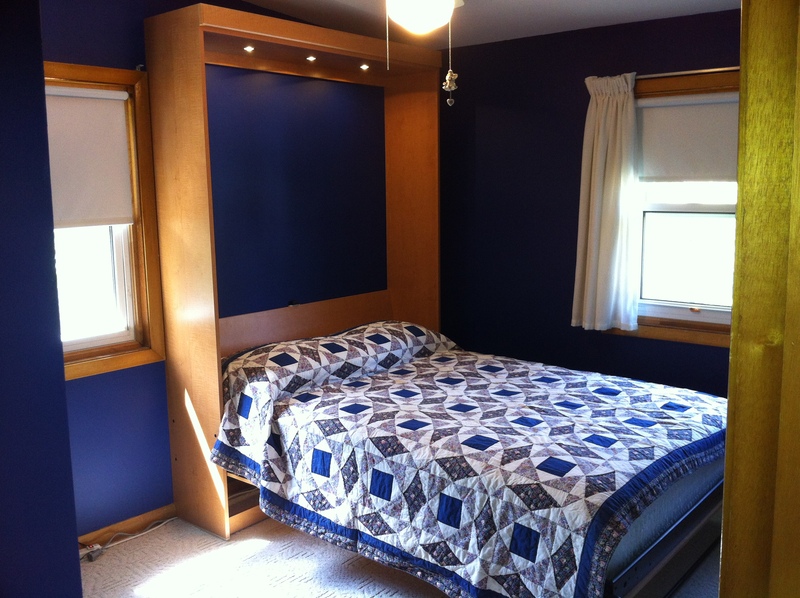 Sarnia Murphy Beds is a division of Ontario Wall Beds.